Meet H.L.Burke, author of Coiled. Read the first chapter; I dare you to resist this story. I’ve always loved stories that sprang from the root myth of Eros and Psyche: the Green Snake, East of the Sun, West of the Moon, even Beauty and the Beast takes obvious inspiration from this tale of two people falling in love, sight unseen, and the idea of inner vs outer beauty. I also like how in the end the princess usually has to go on a quest of redemption to save her prince. I also really really like snakes. Finding value in what truly matters rather than outer things. 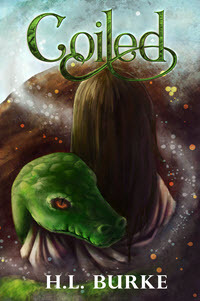 Laidra and Calen are both outcasts because of things beyond their control—Laidra because she is perceived as ugly and therefore valueless, Calen because of the fact that he sometimes turns into a giant, man-eating snake. But when they accept each other, a bond forms which leads to them standing together against the world (or slithering together, as the case may be). The world of Coiled is roughly parallels ancient Greece, but slightly altered. Instead of Athens and Carthage we’re presented with Oleva and Carta. However, the polytheistic pantheon of many squabbling gods is a plot point, and you’ll find Gorgons, Satyrs, and Naiads within. I tend to write in an optimistic, whimsical manner that gets me labeled as YA even when I write for adults because I can’t stand to stay in a cynical or jaded mindset for long. This is more acceptable writing for young readers—though obviously there is some pretty jaded YA out there as well. Also, I find that using younger characters often adds to the opportunities for discovery. You’re with the character at the start of their journey and you get to explore the growth as they find out what it means to be themselves in a world that is pulling in multiple directions in an attempt to mold them into something else. Relationships are a big part of why I write what I write. This story is clearly a romance. The original fairy tale is a love story. The way the two main characters come together is what makes me go melty, and I love to write the stuff that makes you go awwwwwwww. However, it is also about family in a broader sense, about how it shapes us, about what a mother might do to protect a child, or about how it hurts when those who should be our greatest defenders don’t give us the love we desire. Born in a small town in north central Oregon, H. L. Burke spent most of her childhood around trees and farm animals and was always accompanied by a book. Growing up with epic heroes from Middle Earth and Narnia keeping her company, she also became an incurable romantic. 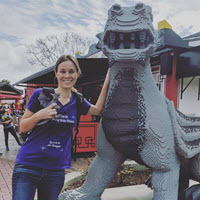 Her obsessions include dragons and tales about inner beauty and character overcoming extreme circumstances, and she hopes her work reflects a sense of God’s great plan for those who seek Him. You can keep up with her latest by visiting her website at http://www.hlburkeauthor.com.